Want to get toned arms? Try using battle ropes, like this! Battle ropes are simply awesome. Have you ever tried them? If you want to sculpt your arms, then battle ropes are a fun & effective way to do it. Try these moves our dedicated members are showing you here. These are a few of the awesome fat burning workouts we do in our routines. Quick total body blast! This 10 minute TRX full body workout is intense. You'll be sweating & breathless in just 10 minutes. Follow along this full length TRX workout video & transform your body fast. Progressions are shown, to challenge different fitness levels. Get ready for a challenge! Like this 10 minute TRX full body workout? Let us know in the comments...your feedback is important. We're here for you. Plus, if you're in the Danbury CT area, come join us for a TRX bootcamp session! Super quick & effective fat burning mini band workout. Follow along this 10 minute miniband workout routine! It includes cardio, abs & glutes exercises. You will be feeling the burn! Warmup is also included in this video. Let's do this! Follow along in real time with us! Perform each move for 50 seconds, followed bt a quick 15 seconds rest period, before going to the next exercise. Once you complete all 4 loop bands moves in the circuit, repeat them one more time. You will be breathless & sweaty in just 10 minutes! We shot this mini band workout video on Facebook Live. How do you like these live follow along workout videos? We love incorporating these mini band exercises into our Max's Best Bootcamp workouts. If you're in the Danbury CT area, come join us for an awesome fat burning session. Click LEARN MORE to apply today. We will help you create a simple effective diet & exercise plan that will get you results, whether you're in the area, or across the globe! Super quick & effective fat burning kettlebell workout. Follow along this total body 10 minute workout routine! It includes cardio, abs & kettlebell exercises. You will be feeling the burn! Warmup included. Let's do this! Follow along in real time with us! Perform each move for 50 seconds, followed bt a quick 15 seconds rest period, before going to the next exercise. Once you complete all 4 moves in the circuit, repeat them one more time. You will be breathless & sweaty in just 10 minutes! We shot this kettlebell workout video on Facebook Live, so let's connect there too (we're Max's Best Bootcamp over there). How do you like these live follow along workout videos? If you liked this, you'll love working out with us at our Danbury CT facility...come try your first session on us! To get the nation into better shape, it's got to start at a local level. That's why we partnered up with Lululemon Athletica, to give a free workout to our community. Danbury Connecticut residents were in for a treat, when Max's Best Bootcamp and Lululemon hosted this free boot camp workout series called Summer Sweat Saturday together at Kenosia Park. The workout was lead by yours truly, master personal trainer Max Barry. Everyone got sweaty, toned up, tanned up, and summer body ready! 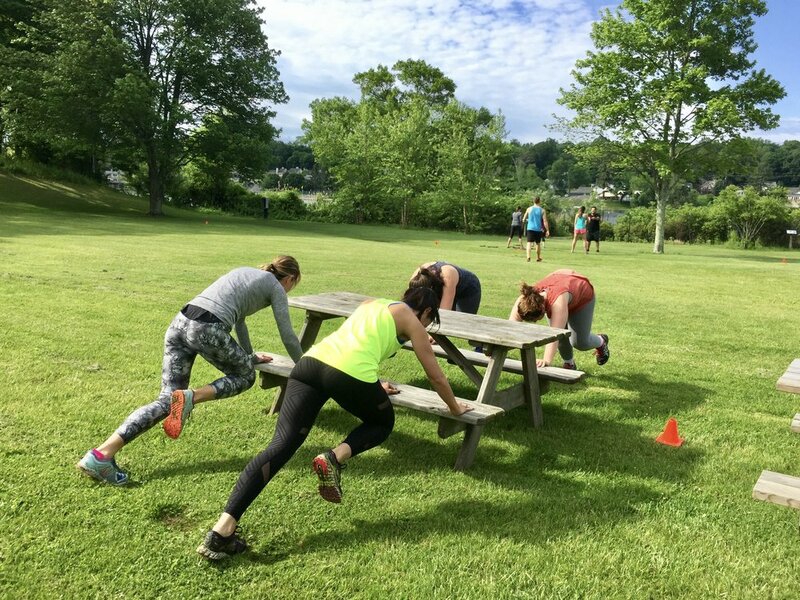 It was a 60 minute boot camp workout by the water at Kenosia Park, in Danbury CT. Get a glimpse of what it was like to be there in this highlights video! It started with partner exercises, then the main routine included bodyweight, cardio, abs, and resistance bands to work those glutes & total body...what a fun day! HIIT and circuit training are the most effective routines for fat loss and conditioning. Try some of these boot-camp workout ideas at your gym or outside with your workout buddy! Better yet, if you live in the area, come try them with us at our clean & spacious facility. Which ones have you tried? Which exercises do you think will burn the most? Fat burning partner workout. 9 moves. No equipment. 10 minutes of non-stop partner exercises that are easy to follow & highly effective for fat loss! Cardio and abs partner workouts are the best. Grab a buddy & enjoy this routine anywhere anytime! Follow along this no equipment partner workout with Max & Jess. This whole routine, as shown, is 10 minutes long. Feel free to perform 1-4 rounds total. If you're doing multiple rounds, take 1 minute breaks in between each round. We include these partner exercises & so many more to get awesome results for our members. Come join us for a fat melting group training session, so that we can get create a custom fitness plan that will accelerate your results fast...simply click the TRY FREE button below to apply for your complimentary session today! Which were your favorites drills? Do you have any exercises that we missed, that you do with your buddy? Leave your ideas & questions in the comment section. Perform each move for 50 seconds, rest 15 seconds in between each exercise, then 60 seconds rest in between rounds. Complete 3 rounds total. Have you ever tried a boot camp style workout before? You'd be surprised what you can do! If you're in the Danbury CT area, let me & my team of certified personal trainers create a fitness plan that will get you results fast. Simply click on CONTACT US button & we'll get you on track today! Kick off 2017 right, with this no excuses 4 minute workout! This is a quick workout to burn fat that includes cardio abs exercises. Best part, there's no equipment needed! Bodyweight baby, yeah. Do this quick 4 minute workout routine at home when you're pressed for time - or at the end of your workouts - as a fat burning bodyweight finisher. How many rounds can you do in 4 minutes? I managed to get 9 rounds done, but am going to try to beat that later today again, less talking, haha! Curious to see how you guys liked this format. Should we make a series of these quick 4 minute bodyweight workout routines? We love bodyweight exercises at Max's Best Bootcamp. They're a great addition to a solid workout program. For truly effective fat loss, you need a complete system, that will help you reach your goals...we make that happen for our clients & we can push you properly, to get your results faster. Come try a complimentary bootcamp session if you live in the Danbury CT area! Simply click TRY FREE button below to apply. Want the best kettlebell workout for fat loss? Try this intense 12 minute HIIT routine! (PART 4) It includes strength, cardio and bodyweight exercises for an efficient total body blast. Created and demonstrated by Fat Loss Expert and Master Personal Trainer, Max Barry. You may perform this routine as is, or double it, making it a 24 minute total body blast! Need help with you form? Need some extra motivation? Join us a bootcamp, if you live in the greater CT area. We've gotcha covered...just click TRY FREE below to apply today! If your new to kettlebells, we recommend you learn the basics from a certified personal trainer near you. They're amazing, but the fundamentals are key to maximizing their benefits!